Uni-loc and Benbo offer the same 'curved' bolt tripod design, so it's no surprise that the Uni-Loc 1600 has the same set-up procedure as the Benbo Trekker. The best method is to loosen the large bolt, touch the 'forward' leg to the ground then move the other two back into the required position. Then, move the centre column into a vertical position and lock the bolt. It's a bit like getting a baby giraffe to stand up for the first time. The centre column doesn't have to be vertical, of course. In fact it can be rotated through a full 360 degrees, even touching the ground beneath the tripod if required. You get similar flexibility with the legs, each of which can be moved to and locked at any angle relative to the rest. But this does all take a little practice before you've managed to master the whole process. Once 'locked' into position, the Uni-Loc tripod is immensely rigid and stable. The sealed legs mean that you don't have to worry about standing it in mud, sand or water. 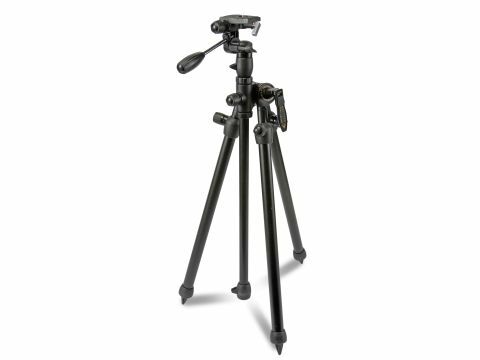 However, since there are only two sections, this tripod is quite long even when collapsed, and doesn't have a great maximum height. For height, you need to rely on the long centre column, and that introduces some wobble. With the Uni-loc you can shoot at ground level, against walls, alongside tabletops... its flexibility is extraordinary. 'Tripod' is too small a word for it. It's more a set of infinitely adjustable rigid limbs. The Uni-Loc is versatile but demanding. It loses rigidity beyond chest-height but at or below these levels it's superb. However, while the Uni-Loc pan and tilt head we tested is strong, it is somewhat stiff in action.